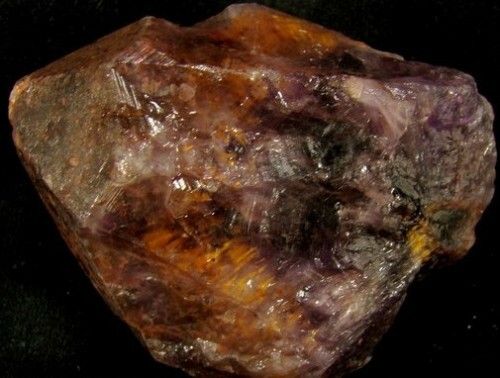 CACOXENITE IN AMETHYST, also commercially made available under various trademarked names such as Super Seven, Melody's Stone and Sacred Seven, is a truly unique stone which contains all the energies of Amethyst, Clear Quartz, Smoky Quartz, Cacoxenite, Rutile, Goethite and Lepidocrocite combined. 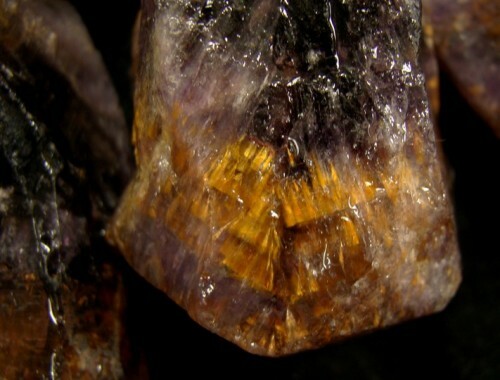 Naturally formed Citrine and Ametrine also are present in many of the pieces from this location. And, rarely, once in a while crystals may also have Phantoms of Hematite, Goethite or Chlorite as well as the typical growth patterns of the Amethyst itself which will form Phantoms due to different amounts of the material responsible for coloration/deposition of surface contaminants being present during each layers' growth cycle. This "flambeau" stone (displaying what appear to be tiny flames of fire) exhibits a phenomenon often referred to as St. Elmo's Fire, or the electro-magnetic emissions sometimes seen during an electric storm above a spire or the mast of a ship. (Saint Elmo is the patron saint of sailors.) Occasionally, Cacoxenite in Amethyst is also said to exhibit a display resembling the Aurora Borealis, or the Northern Lights. Cacoxenite in Amethyst is one of the few stones that retains its clarity and energy and never needs cleansing or energizing. Even though each stone may not visually show each mineral, it has been said that all pieces carry the energy of all seven minerals. It is a powerful stone for healing the earth, mind body and spirit disease. The very nature of the stone means that it is not associated with any one chakra; instead it is fantastic at healing, balancing and energizing all seven charkras, said to be the basis for the trademark name Super Seven). In addition to the properties of each individual mineral contained within the stone, Cacoxenite in Amethyst is a wonderful companion for those who are seeking to dispense with old ways of thinking and acting which do not allow the ways of "peace and harmony" to rule in their life. Said to represent the universal "brotherhood" of humanity, all configurations have also been of tremendous assistance in awakening, stimulating, and developing psychic abilities, including telepathy, clairvoyance, clairaudience, and clairsentience. Cacoxenite in Amethyst is a wonderful gift from Mother Earth which can benfit everyone. It also assists us in developing our gifts and abilities used in conjunction with the healing and ascension of Earth Mother and all her inhabitants. Cacoxenite in Amethyst is especially good for those who may be experiencing empathetic feelings with Mother Earth, or are dealing with the results of the "earth changes" which have already begun and are progressing rapidly now. AMETHYST is extraordinarily special and is perhaps the first crystal many of us think of to represent the metaphysical world. Amethyst is one of the Quartzes, and its exquisite purple and lavender tones work on the Third Eye Chakra and opens and activates the Crown Chakra. It balances the physical, intellectual, and emotional bodies and provides a connection to the other worlds. Amethyst clears your aura. It stabilizes and transforms any dysfunctional energy you may have. It works very well on addictions, providing the wearer/user is willing to do the work. It is a great gemstone for meditation, allowing you to attain and maintain that state. CACOXENITE is a wonderful companion stone for those who are here to assist in the "ascension of humanity." It can help to bring a new "spiritual awakening," promoting new ideas and understandings, and aids us in seeing the positive, and benevolent sides of life. CLEAR QUARTZ CRYSTAL, sometimes known as Rock Crystal, is a beautiful manifestation of God's pure love and light. Clear Quartz Crystal helps to bring "celestial" energy to the soul, and to enhance and amplify both energy and thoughts. It is a wonderful tool for communication and for receiving information from other-worldly masters, healers and teachers. It can greatly increase the energy flows of love, light, peace and harmony for the greater good of all mankind. GOETHITE helps us to become "in tune" with the energies of the ethereal realms and the Higher Self. It can facilitate and enhance communication with the Angelic Realms, and can stimulate and amplify clairaudient abilities. Goethite is also wonderful for those wishing to lessen the burdens of distraction, and increase their abilities to concentrate and focus. LEPIDOCROSITE can help to promote grounding and centering, while acting as a stimulus to intellectual pursuits. It is extremely beneficial in clearing any mental confusion, and to expanding and retaining knowledge. This stone is also excellent for all those on an "ascension" path, helping to awaken and enhance communication with the Higher Self, and the Angelic and ethereal realms. When Lepidocrocite is within Amethyst, all of your intuitive abilities are enhanced. Lepidocrocite within Amethyst is useful for astral travel and is a huge help connecting your physical with your astral body. This crystal helps your brain store information while helping you gain knowledge. Lepidocrocite works very well to balance your energy. It helps you become a better healer and teacher. RUTILE can bring strength coupled with love, ease in making transitions, and an accelerated growth in all levels of development, body, mind and spirit. It is an excellent choice for promoting and building stability within relationships, marriages and emotional or mental imbalances. In addition, it is an incredible tool for dispelling unwanted energies in both the physical and spiritual realms. Rutile in Amethyst Quartz intensifies the power of Quartz Crystal. It can help you get to the root of a problem and, because the true cause has been revealed, you can resolve the problem. It is quite useful for astral travel; giving insight into the reasons you are visiting the places you visit. Rutile in Amethyst Quartz encourages growth in all areas of your life and brings tranquility, stability, reason, and order to your life as well. Rutile in Amethyst Quartz is an excellent healing crystal and helps balance the aura by repelling negative energy. SMOKEY QUARTZ is a Crystal that exhibits light to dark smokey grey through black color within the crystal, usually due to being exposed to Uranium or other natural radiation during growth. It is a wonderful companion stone for those who seek "grounding and centering," enhancing focus and attentiveness to the moment. In addition, Smokey Quartz is an excellent choice for those seeking to promote creativity and "good business acumen" within all relationships in their lives, and is also an excellent choice for those who are under a lot of stress. CITRINE is yellow/gold Quartz. Citrine brings prosperity and abundance. Citrine helps to bring us wealth and maintains it in our lives when we learn to trust the universe. It activates, opens, and energizes both the Navel Chakra and Solar Plexus Chakra. In all forms, but especially the faceted form, Citrine stimulates the Crown Chakra, becoming quite useful for problem solving and general mental awareness. It aligns all of the Chakras with the ethereal plane. Citrine encourages motivation and helps you to be emotionally balanced. It helps you stabilize your emotions, release your anger, and helps provide self-assurance. Citrine takes negative energy and dissipates and transmutes it rather than holding on to it and accumulating it. As a result, it never needs cleansing. It is excellent for clearing and aligning your aura.